A life away from traffic noise and exhaust fumes – more and more people are drawn to water. Energy self-sufficient floating homes not only fulfill the criterion for this new lifestyle, they can also boost economy. Medium-sized companies, manufacturers, universities as well as two Fraunhofer Institutes work hand-in-hand on the autartec project. Floating homes are becoming increasingly popular in Germany – not only as holiday homes, but also as permanent residences. The Lusatian Lake District (Lausitzer Seenland) is particularly suitable for such a lifestyle: with its 23 lakes and a surface area of over 32 000 acres, it is the largest artificial lake district in Europe. Over decades, the region, which is located between the German states Saxony and Brandenburg, had been characterized by open-cast lignite coal mining. In the coming years, this way of life of living on water will help enhance the region's attractiveness and boost its economy. This is also the objective of the Lusatian autartec project, which the two Fraunhofer Institutes based in Dresden, the Fraunhofer Institute for Transportation and Infrastructure Systems (IVI) and the Fraunhofer Institute for Ceramic Technologies and Systems (IKTS), are involved in, as well as other partners from the region such as medium-size companies, manufacturers, the Technical University of Dresden (TUD) and the Technical University of Brandenburg (BTU). They will all work hand in hand to build a floating home on Lake Geierswalde, to the northwest of the city of Hoyerswerda, by 2017. This floating home will not only look elegant, it will also be able to provide for its own water, electricity and heat. 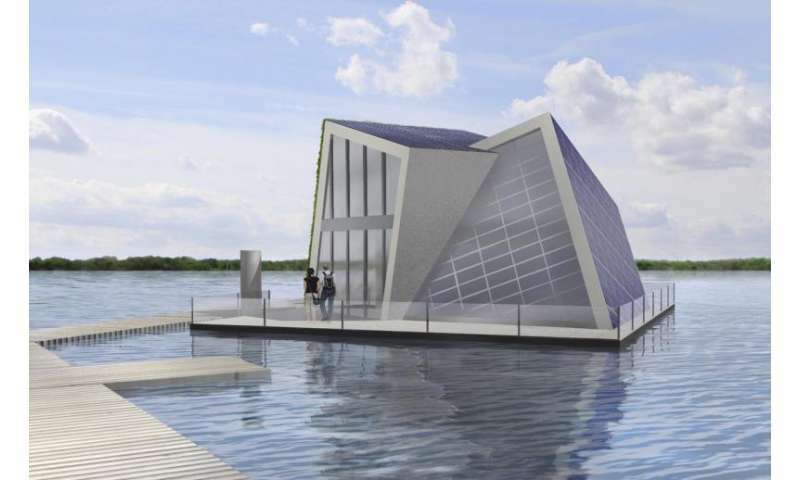 "These kinds of energy self-sufficient floating homes do not exist yet," says autartec project coordinator Professor Matthias Klingner of IVI. Many lakes in the Lusatian Lake District are cut off from infrastructure such as water and energy supply. "We want to find a solution for this kind of environment," says Klingner. Standing on a 13 by 13 meter steel pontoon, the house extends over two levels and offers 75 square meters of living space on the ground floor, and another 34 square meters on the first floor. A 15 square meter terrace overlooks the entire lake. The house combines modern architecture and structural engineering with state-of-the-art equipment and building facilities. For example, solar cells are integrated in the building envelope and lithium polymer batteries store the collected energy. In order to save space, the battey systems developed at IVI are integrated into the textile concrete walls or into the stair elements. Researchers at IVI are also working on the efficient provision of heating and cooling systems. A salt hydrate fireplace provides heat on cold winter days: above the fireplace there is a tub filled with water and salt hydrates. "When the fireplace is on, the salt hydrates liquefy and begin to absorb heat," Dr. Burkhard Fassauer of IKTS explains. When the salt hydrates are completely liquefied, the thermal energy can be stored almost indefinitely. In order to release the heat when required, radio-based technology is used to induce crystallization. The principle is known from pocket warmers: to induce crystallization, a metal disc inside is clicked so that the pocket warmer solidifies and gives off heat. When heated in water, the crystals liquefy and the heat is stored until the next click. However, a fireplace is not enough to heat the house during the winter. This is where a zeolith thermal storage unit in the pontoon can help: the zeolith minerals are dried during the summer – a purely physical process in which heat is stored. "In winter, the moist air is enough for the storage unit to give off heat," Fassauer explains. An adiabatic cooling system provides for cool air in the summer. Unlike conventional air conditioning systems, it does not require electricity but uses the principle of evaporative humidification to cool. A surface on the side of the house is landscaped and moistened and the process of evaporation then cools the building envelope. The experts at IKTS are responsible for the water supply in the houseboat. "We are currently developing and experimenting with a closed loop system for drinking and service water," Fassauer explains. To accomplish this, the scientists rely on a combination of ceramic membranes and various electrochemical and photocatalytic processes. Ashore, wastewater is usually treated using biological processes. This is not possible in a floating house. "We must rely on physical and chemical methods. Thus, ceramics provide very efficient ways to bring together processes like photocatalysis, electrochemistry and filtration in a confined space," says Fassauer. Other materials such as steel and plastic would fail in such aggressive processes. The equipment for the circulatory system will be accommodated in the pontoon.